Vivability - a new website launched by Net Maintain. 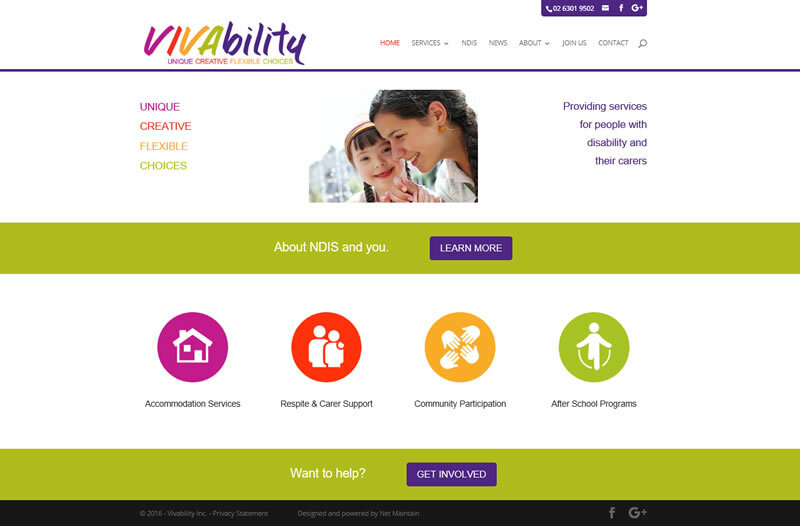 Vivability provide services for people with disabilities and their carers. Among those services are accommodation, respite and carer support, teaching life skills and providing social and recreational opportunities. This new website is part of a major rebranding and marketing initiative. New logo, colour scheme and corporate identity were all included as part of the overall design brief. The board of Vivability were looking for a vibrant website, full of life and colour. The website launch coincided with the opening of a new building and introduction of the new corporate branding to the public. Construct a new website as part of a re-branding of the organisation. Incorporate new colours, logo and marketing direction.